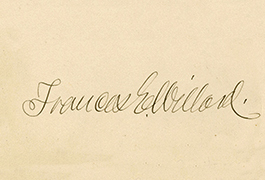 Signature for a calling card. Frances Elizabeth Caroline Willard (1839–1898) was an educator and social reformer dedicated to the causes of temperance and women's suffrage. 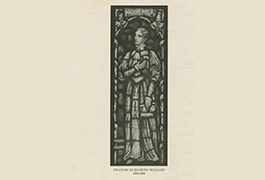 Willard graduated from North Western Female College in Evanston, Illinois, the valedictorian of the class of 1859. The following year, at the age of 21, she joined the Methodist Episcopal Church. After serving as president of the Evanston College for Ladies from 1871 to 1873 and Dean of Women at Northwestern University in 1874, Willard was elected president of the Chicago branch of the Woman's Christian Temperance Union (WCTU). She worked for evangelist Dwight L. Moody in 1877 organizing women's meetings prior to becoming president of the Illinois WCTU in 1878. From 1879 until her death in 1898, she served as president of the national WCTU. In 1883 she founded the World Woman's Christian Temperance Union. 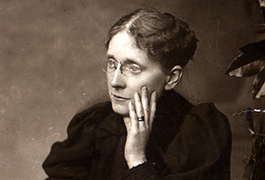 Frances Willard traveled and lectured widely. Her interest in politics led to the organization of the National Council of Women, the General Federation of Women's Clubs, and the Prohibition Party. To honor the memory of Frances Willard, the Methodist Episcopal Church General Conference of 1936 adopted a resolution describing Willard as "that able champion of the rights of women and the cause of total abstinence, that fearless and mighty enemy of the American liquor trade" and urging all Methodists to study "the life and work of Frances E. Willard, and the contribution she made to the moral progress of America and the world." 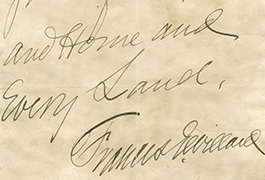 This digital collection on Frances E. Willard presents images of manuscript letters written by Willard between 1869 and 1895, a signed calling card, a large print of her likeness, and a small print of a stained glass window. 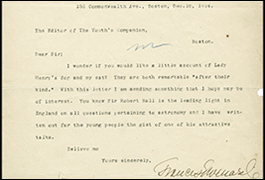 A finding aid is available at Texas Archival Resources Online. 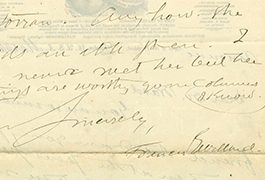 For more information on the Frances E. Willard Documents and Images at Bridwell Library, please contact Bridwell Library Special Collections.